FDA approved 31 food contact substance (FCS) notifications (FCNs) submitted by a total of six PFAS manufacturers between 2002 and 2016. The notices covered 19 distinct complex chemical mixtures: 14 to coat paper and 5 to make molded repeat use materials like gaskets and baking pans. FDA refers to each of these complex chemical mixtures as an FCS. The 19 FDA-approved PFASs generally consist of reactants (also called monomers), oligomers (a few monomers linked together), and polymers (many monomers linked together) as well as solvents. Using the Washington State definition of PFAS, if one of the monomers is a PFAS, the oligomers and polymers containing it are, therefore, also PFASs. When submitting a notice, companies have to report to FDA the identity of the polymer or oligomer, all reagents used in their manufacture, and all impurities that may be present in the FCS. For each, they must explain how much will remain in the coated paper and migrate into food. We assembled the chemistry-related portions of the 31 FCNs into a single PDF (45 MB, 1028 pages). Below are examples of PFASs in the FCNs and the type of information submitted to FDA. For the most part, these are not perfluorinated alkyl acids, the type of chemical included in EPA’s Method 537. The name of the PFAS monomer is in boldface. Archroma FCN 1493 was approved by FDA in 2014. See page 3 to 34 of PDF. The company described the FCS as a copolymer of 2-(dimethylamino)ethyl methacrylate with 3,3,4,4,5,5,6,6,7,7,8,8,8-trideacfluorooctyl methacrylate, N-oxide, acetate in the manufacture of food-contact paper and paperboard. The commercial FCS is a liquid formulation containing approximately 18% of the polymer with 82% impurities and reagents. The notice lists 13 reagents/impurities, three of which are expected to remain in the paper; only two are disclosed: 1H,1H,2H,2H-Perfluorooctyl methacrylate and 2-Dimethylaminoethyl methacrylate. The typical amounts of impurities expected to remain in the paper vary from less than 200,000 to 334,000,000 ppt. Asahi FCN 1186 was approved by FDA in 2012. See pages 102 to 123 of PDF. The company described the FCS as butanedioic acid, 2-methylene-, polymer with 2-hydroxyethyl, 2-methyl-2-propenoate, 2-methyl-2-propenoic acid and 3,3,4,4,5,5,6,6,7,7,8,8,8-tridecafluorooctyl 2-methyl-2-propenoate, sodium salt. The commercial FCS is available in a 15% solution in water with 85% expected to be reagents and impurities. There are 15 reagent/impurities, four of which are disclosed: 2-propenoic acid, 2-methyl-, 3,3,4,4,5,5,6,6,7,7,8,8,8-tridecafluoro octyl ester; 2-propenoic acid, 2-methyl-, 2-hydroxyethyl ester, 2-methylpropenoic acid, and butanedioic acid, 2-methylene-. Four of the 15 chemicals are expected to remain in the paper. Information on the typical amount of impurities remaining in the paper was redacted. Solvay Specialty FCN 416 approved by FDA in 2004. See pages 823 to 875 of PDF. The company describes the FCS as diphosphoric acid, polymers with ethoxylated reduced methyl esters of reduced polymerized oxidized tetrafluoroethylene. Its trade names are Fluorolink® F10 and Fluorolink® PT5045. There are 11 reagents/impurities, all of which are disclosed: ethoxylated perfluoroether diol, water, phosphorous pentoxide, ethyl acetate, isobutyl alcohol, tetrafluoroethylene, ethylene oxide, 1,4-dioxane, phosphoric acid, ethanol, and acetic acid. Eight of them are expected to remain in the paper with a typical residual or less than 5% of ethoxylated perfluoroether diol and less than 28,000 ppt of tetrafluoroethylene. Solenis (formerly Hercules) FCN 518 approved by FDA in 2005. See pages 625 to 652 of the PDF. The company described it as 2-propen-1-ol, reaction products with pentafluoroiodoethane-tetrafluoroethylene telomer, dehydroiodinated, reaction products with epichlorohydrin and triethylenetetramine. 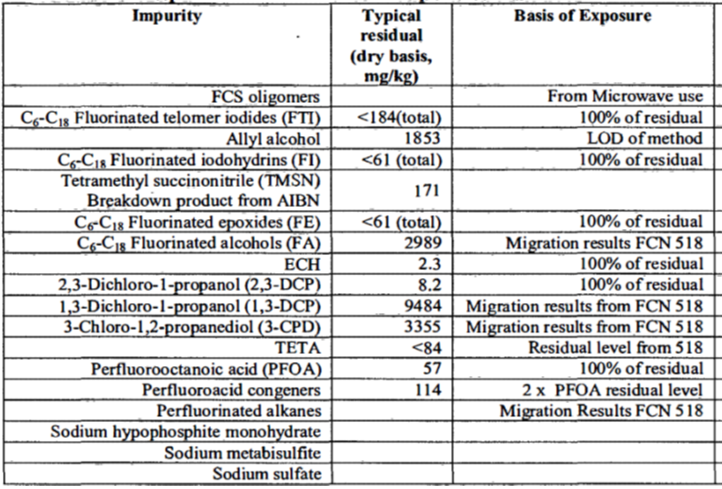 Figure 1 is an extract from the table in the FCN listing many PFAS impurities. Chemours FCN 885 reported for their FCS polymer residual levels of PFHxA, PFHpA, PFOA, and PFNA. See page 189 of PDF. A company representative told us that the FCS was not used in the US due to lack of a market. Solenis FCN 518 reported PFOA as impurity as described in Figure 1. Before drawing any conclusion that most FDA-approved PFAS will not be detected by Method 537, we need to point out that there are three significant qualifiers to that conclusion. First, most importantly, FDA’s responses to our FOIA contained extensive redactions of chemical names based on companies’ claims that the information is a trade secret and commercial or financial information or that extraordinary circumstances exist. A good example of the extensive redactions is Daikin’s FCN 933 where 180 pages of nine chemistry-related attachments were completely blacked out. Only the title page providing the number of the attachment was not redacted. See pages 342 to 531 of PDF. We obviously can’t determine whether or not some of the redactions include the names of the 18 PFASs measured by Method 537. Second, some of the documents from FDA were scans of paper copies that we ran through optical-character recognition. So, the CAS numbers, chemical names, or acronyms we searched for may not have been captured properly. Third, Method 537 only measures perfluorinated alkyl acids, and many of the chemicals identified in the FDA-approved FCNs are not acids – they have other functional groups such as alcohols attached to the molecule. Despite these limitations, our review of the chemistry showed use of multiple PFASs and a variety of impurities that could be released into water from the facilities making or using them without detection by Method 537. These chemicals would likely show up as unidentified peaks in the drinking water results. Question 2: Did the companies with FDA-approved PFASs provide the agency with methods to measure the chemicals in food? The answer is “yes, but.” As part of the FCN process, companies are required to provide a detailed description of the analytical methods used to measure the amount of a chemical and related impurities that would migrate into a food simulant such as oil or vinegar-water. The description must include raw data, sample instrument output, and a summary of method validation results. We reviewed these methods to determine whether they could be used to measure PFASs at the parts per trillion levels. With the many redactions by FDA, it was difficult to discern the details on the methods and the detection levels for PFASs. From our review, we saw a variety of methods but none appeared to be as sensitive as EPA’s Method 537. One reason for that might be that the companies’ analytical methods need to determine trace amounts in a different liquid matrix, such as food grade oil or vinegar-water mixtures and those methods do not have the same sensitivity as measuring in drinking water. They appeared at best to be able to detect levels in the low parts per billions – hundreds of times higher than the health advisory for PFOA and PFOS in drinking water. It is also important to note that some of the FCNs were approved more than a decade ago; since then, analytical methods have advanced and are now able to detect substances at lower levels. When EPA, a state or a utility reports on the amount of perfluorinated alkyl acids in water, the reported levels are unlikely to include the FDA-approved PFASs and their impurities. In addition, the methods reported to FDA and used by the companies to determine whether the chemicals are contaminating food are not sensitive enough to determine if they are present at EPA’s PFOA/PFOS health advisory level. At its PFAS National Leadership Summit, EPA researchers described plans to expand the list of chemicals capable of being analyzed by Method 537 to known PFASs in water, solids, and air. To achieve this requires reliable and relevant analytical methodologies for the PFASs. We encourage FDA and EPA to work together to review the unredacted information in the FCNs to identify whether the methods used by the companies are sufficient or could be improved to determine trace levels in water and other media. We also encourage the companies making these chemicals to provide updated analytical methods when available, assist the agencies in developing reliable methods, and provide samples of the approved substances, raw materials, and impurities to allow for identification and quantification of PFASs. A dozen notices covered different uses for the same FCS. The EPA-method covered 14 substances. Some laboratories have expanded it to include 4 additional substances. We used the larger list from Eurofins to be more thorough. This entry was posted in Drinking Water, FDA, Health Policy, Health Science, PFAS, Public Health and tagged paper mills, PFAS, PFOA, PFOS. Bookmark the permalink. Both comments and trackbacks are currently closed.